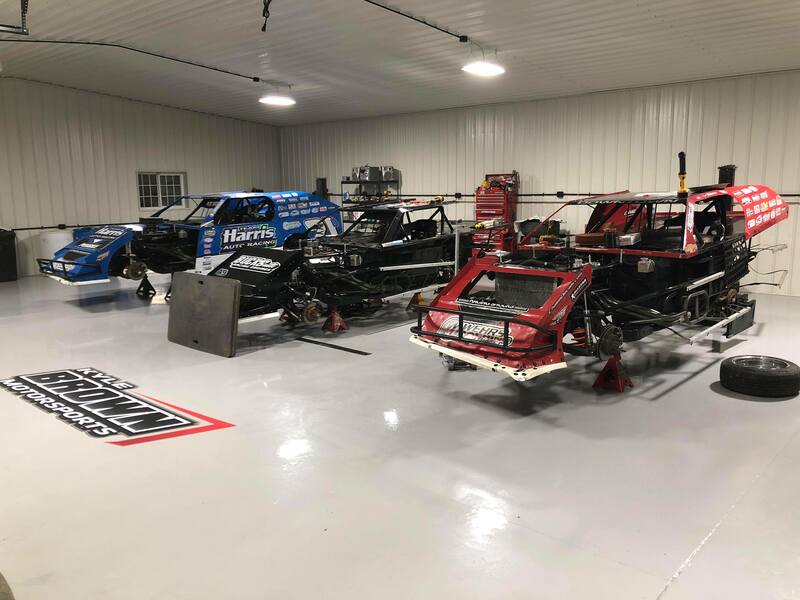 On Friday of September 14th, Marshalltown Speedway hosted the IMCA World Nationals. It was a race that was postponed from earlier in the season. A lot was on the line as the IMCA Modified race winner following the multi-day show would pocket $10,000. To take home the check, drivers had to first qualify for the main event. Two rounds of heat races took care of that. The green flag dropped on heat number two in the first round. Strickler ran three wide into turn one. The car got tight in the middle. Strickler pushed up the hill. Kyle Brown was already on the gas and coming around on the outside. Strickler used up the entire race track on the exit as Brown was pushed off the track down the back stretch. Kyle Brown (#21K): “In the first round of heats I started behind Kyle and got a run in turn 1 and 2 to his outside he got tight and I trusted that he would keep a lane. But, the push was beyond being able to do so. I ended up off turn 2 luckily with no damage,” Brown explained to RacingNews.co . “We discussed the incident in the infield which he blamed on the track conditions but then later came down and said he saw the video and was apologetic for ‘dooring me off the track.’ At that point, everything was back to normal and we continued to joke around and bench race,” Brown concluded. Kyle Strickler (#8): “The first incident in the first heat race… I was ahead of him. My car got tight and went up the race track. I had no clue he or anybody else was out there. He kinda got pushed off the race track,” detailed to RacingNews.co . The field was inverted for round two of the night. Kyle Strickler and Kyle Brown both started deep in the field for the second round of heat races. Heading into turn three on lap 1, Strickler dropped a slider through the middle of the race track. He drove past four cars all at once. He parked it against the cushion off the corner directly in front of the pole sitter David Brown (Kyle Brown’s father). They came off the corner three wide. David Brown and Strickler fought for space and banged wheels for the lead. Both cars scrubbed speed heading into turn one. Entering turn one, Kyle Brown drove it deep to the middle of the race track. Off the corner, he left the outside lane open for a moment. Brown then closed it halfway off the corner. It was too late. Strickler already put his nose in there. This time, Strickler was the one sent off the race track. On the surface, it would appear that was as a direct retaliation to the first incident. Frame by frame, they mirrored each other. However, Brown insists otherwise. “In my book, that was 100% deliberate. He thought it would be funny to get me back or whatever the situation was. If you’re going to be driving people like that, the rule of thumb is you better be fast enough where they can’t catch ya. Unfortunately, he wasn’t,” Strickler concluded. “Had nothing to do with anything other than I had to win that race to get locked in on points,” Brown concluded. “It was to the point where I had to win that second heat race to start on the front row. I knew Richie Gustin won both of his heats and was going to be really tough to beat,” Strickler stated. After being pushed off the race track, Strickler began running back through the field. However, contact with another car sent him to the tail once more. Meanwhile, Kyle Strickler had been carving his way through the field. He was on a mission and now he had a target. At the white flag, Strickler was on the back bumper of 3rd place. Heading into turn three, Stricker drove to the bottom and went right on by. Kyle Brown was in 2nd place and riding the cushion off the final corner. Strickler gassed it up, setting sail for the already occupied cushion. 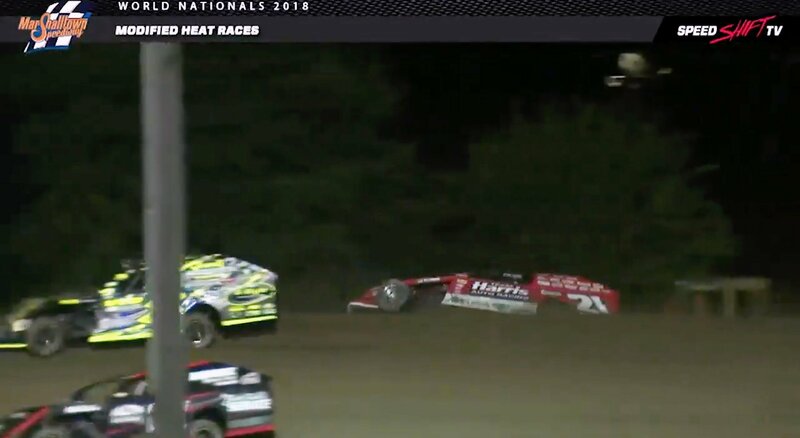 Strickler knocked Brown clear off the cushion and into the wall. As Brown got back to the pit area he was informed that the move from Strickler was done on purpose. “I respected Kyle as a race car driver and enjoyed his friendship through the years but I have more important things on my plate,” Brown concluded. Kyle Strickler went to the pit area with some sheet metal damage. 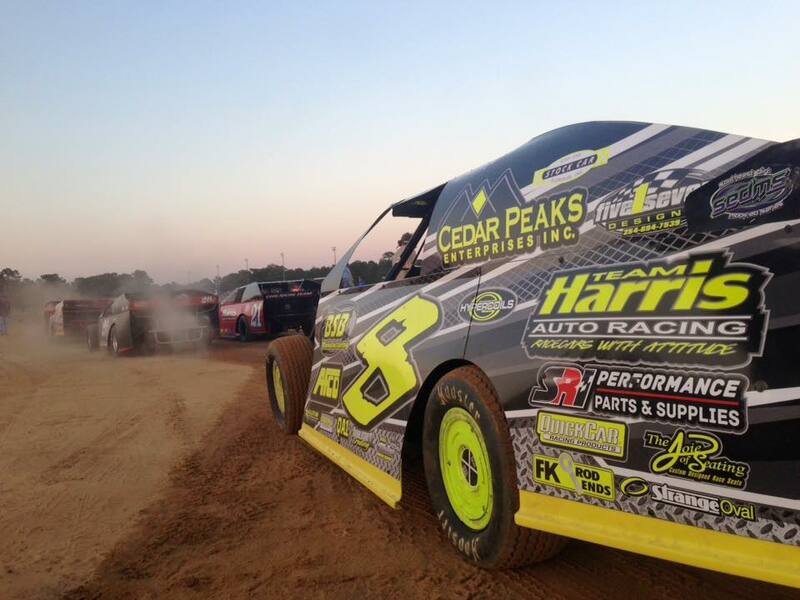 Kyle Brown’s car on the other hand suffered heavy damage and went off on the hook. Kyle Strickler was disqualified from the second round heat race on Friday night. So, you fully understand them putting a DQ on you for that? “Oh absolutely. They just black flagged me for questionable driving. It was a decision that I made, that I knew I was going to get black flagged for,” Strickler continued. The disqualification regulated Strickler to the C Main on Saturday. He transferred to the main event. Kyle Brown got the car fixed up but didn’t finish Saturday’s B Main. The track locked down in the feature race on Saturday night. Strickler tucked in line and finished 20th. To me, the most interesting part of this story is that these two drivers were friends for years. On the Monday leading up to the race, they went golfing together. 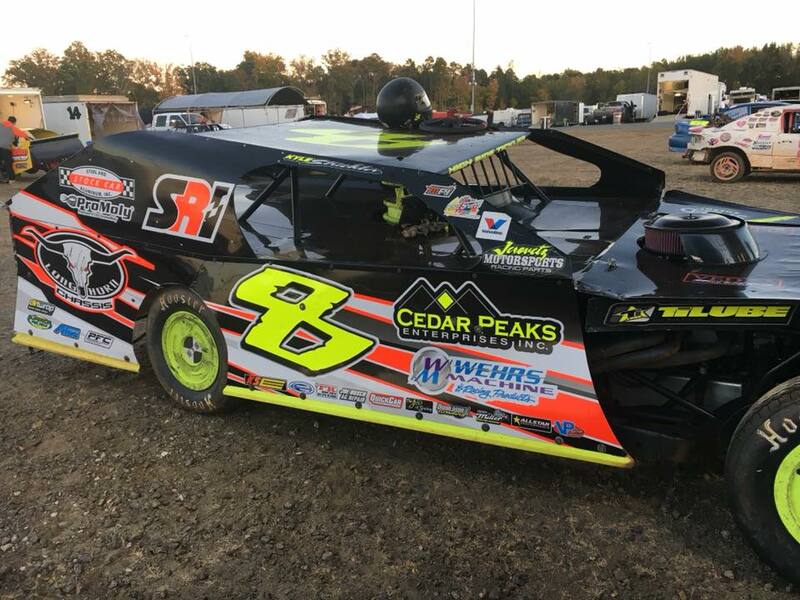 As recently as 2016, Kyle Strickler actually drove for Harris Auto Racing. That was the second time around in a Harris Chassis. Was there any bad blood from the chassis deal in the past? “I’ve just been too nice to him in the past to just let it go. I wasn’t about to just let it go another time. Especially, when I thought we had a really good shot at winning $10,000. Unfortunately, we didn’t pull it off because of that,” Strickler concluded. 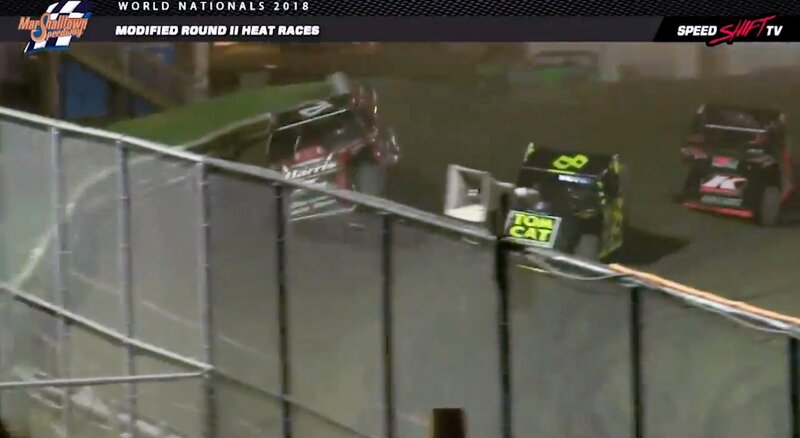 “I lost a friend that night at the racetrack but I am just glad none of the fans or other racers outside the situation got hurt,” Brown concluded.